What’s an anniversary date with no dessert, right? Right. So, after our dinner at Equinox Restaurant, we walked all the way to Esplanade to have our toothsome fix. The 10 minute walk (or was it 15?) did us good, because as full as we were from our belly bulging meal, we were hungry again by the time we reached our destination: Max Brenner. 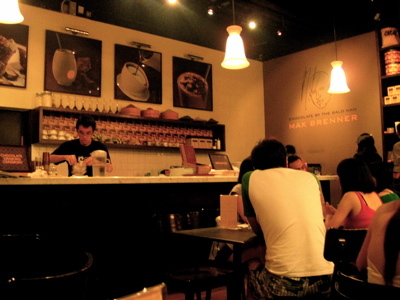 Ah yes, Max Brenner: The famous dessert haven for chocolate lovers like me. With its tag line “Chocolate by the Bald Man,” I was expecting to see cleanly shaved waiters bustling from one table to another, just like back in Manila. But as soon as we entered, my excitement dwindled down to plain disappointment. What?!? No hunky bald men servers? Boo!!! Instead, the staff was composed of young waiters, in probably their early twenties, and an older guy who looked like the owner. They were all dressed casually, in their own and separate style of jeans and t-shirts, with no hint of uniformity whatsoever. We could only pick out the servers from the customers, because they were the only ones up on their feet. Other than that, it would’ve been impossible to spot them.